After the era of smart phones and smart appliances, comes the year of smart furniture. As we welcome more and more technology into our homes, smart home devices become more and more commonplace in our living rooms, bedrooms, kitchens, and even bathrooms. Research suggests that in as early as 2016, $80 million worth of smart furniture was sold to people all over the world. If you want to fill your house with sleek, efficient and easy-to-use devices, here is a list of smart furniture for 2019 that you must include in your house. Gone are the days when you struggled to find a plug to charge your phone. And turning your house upside down just to search for your charger? That’s past too! 2019 is the year of futuristic furniture. And with a table that charges your phone, smart furniture is here to make your life easier. 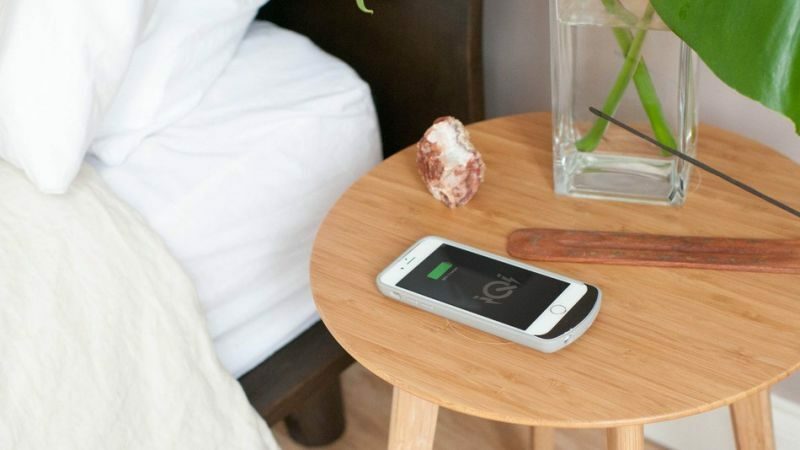 FurniQi has launched a Side Table that can charge your phone in no time. The circle in the center of the table functions as a charging device for your electronic products – especially your phone. And while you charge your phone, you can also sip on your coffee or read a good book. The Side Table occupies a very small space. So, this also becomes yourspace saving furniture for 2019. And priced at just $199, this charging table is worth every dollar. Once you have a smartphone, you can really connect it to anything in your house and control one corner of it from the other corner. And when you think about it, why should your bathroom be left out from this smart living? U By Moen is a smart showerhead, which you can control by a single word or two through your phone. You can turn on/turn off your shower without even entering your bathroom. Moreover, this futuristic furniture allows you to even set, change, or control the temperature of your shower from anywhere in the house. If you are a sleepyhead, you can just set the right temperature of your showerhead from your bed and sleep a little more! At just $460, get access to a bathing luxury like none other. Speaking of bathrooms and toilets…. Smart furniture for 2019 is indeed smart. Take the Kohler toilet, for example. You can connect it with your phone and give simple commands. On your word, the toilet will clean, flush, and even heat itself. Priced at $4,700 – this futuristic furniture is a little on the expensive side. But think about what it does, and it will seem worth the money. Moreover, this one’s sleek – so not only it is one of the best smart furniture for 2019, but also a space- saving furniture. 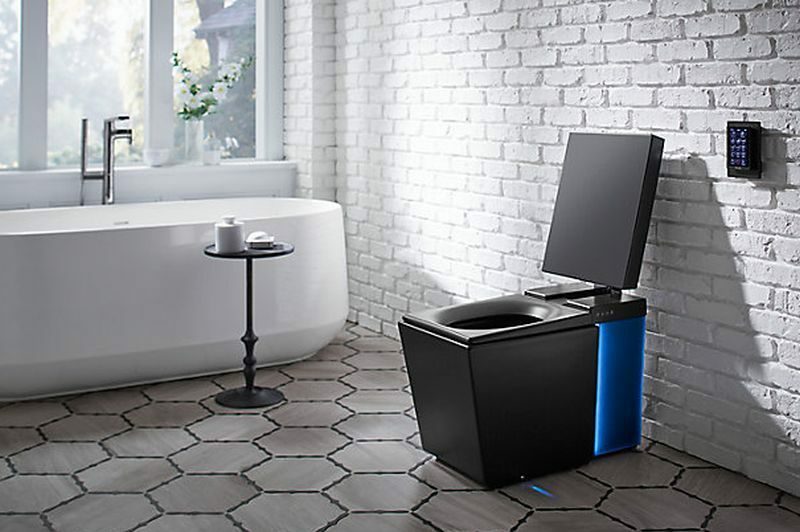 If you are someone who doesn’t like to get their hands dirty, then this smart toilet will save you all the toil. Think about it. With so many food products stacked in your fridge, it is hard to keep a track of the quality of the food, or the quantity, or even the shell life of the products. 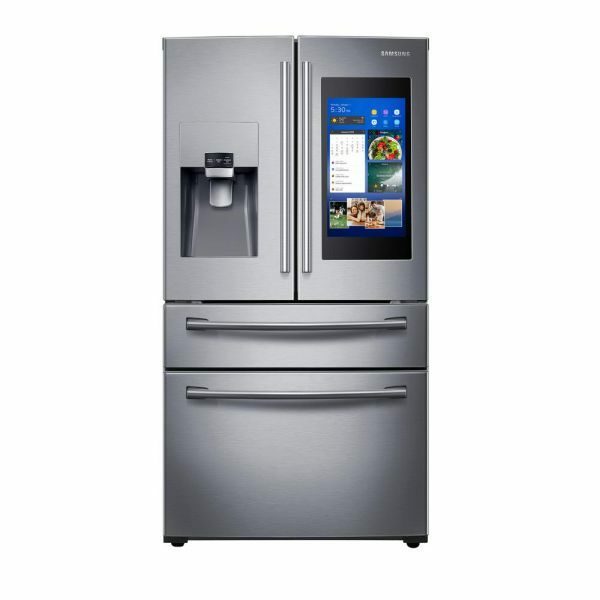 But, Samsung’s Family Hub French Door Smart Refrigerator is the one-stop solution to all your kitchen issues. This fridge tracks the quality and the quantity of your food, along with the expiry dates of all the packed products in the refrigerator. In addition to that, the refrigerator comes with a big screen that screens videos or recipes of the food that you are planning to cook – so that you don’t have to google everything all the time. The screen also monitors your main door, so that you can keep an eye on your living room while being in the kitchen. At $2,099, this refrigerator is one of the best furniture for small spaces. And the digitized technology makes it even more useful for the modern-day kitchen. 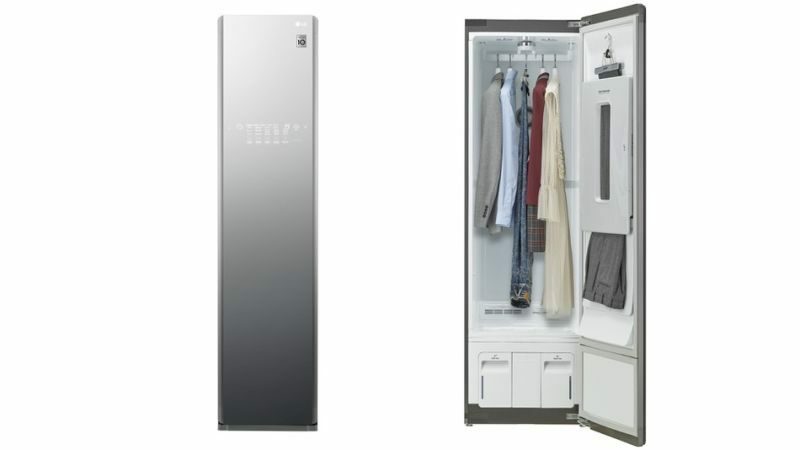 LG has come up with a smart wardrobe that takes little space in your small bedroom. Moreover, its in-built sensory technology will also steam or aerate your clothes according to your choices. This wardrobe comes with a touch screen that’s Wi-Fi enabled, so that you only need to touch a button and relax while your clothes get steamed. However, the best part about this smart wardrobe is that it is one of the best furniture for small space. This wardrobe takes minimum space in your house and does the maximum work for you. While are talking of wardrobes and closets…. This smart furniture for 2019 is still in prototype stage. But that shouldn’t stop you from adding it to your list of futuristic furniture. Designed by Carlo RattiAssociati, this sofa is called Lift – Bit. 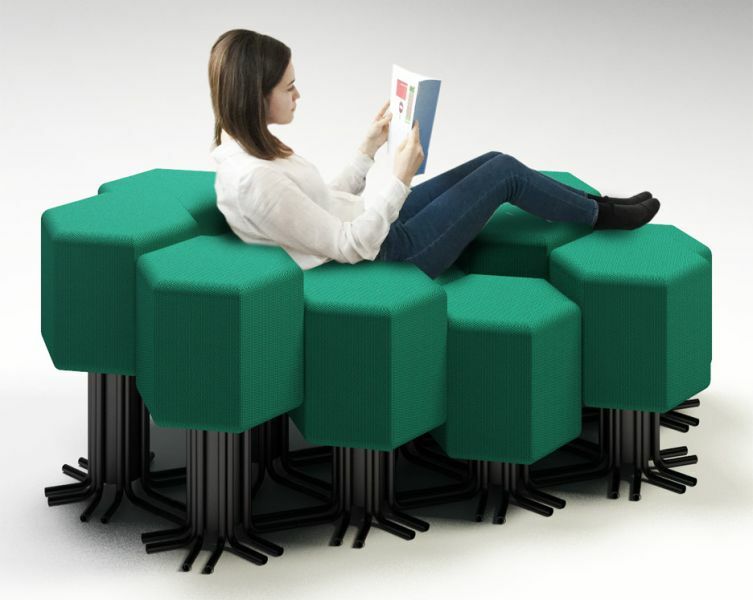 Made of circular stools, this sofa can follow your voiced commands to change size and shape. So, all you have to do is connect your phone to the sofa, use your voice to give a command, and watch it unfold before your own eyes. This sofa can transform form a sofa to a bed, from a sofa to a couch, from a bed to a couch, and vice-versa. Save yourself the effort to maneuver the heavy couch here and there, from one shape to the other. Just get a Lift-Bit, save time, and make life more convenient. Ori, a robotic interior firm, based in Boston, boasts of its latest smart furniture for 2019 – the Pocket Closet. Connect your phone to this closet and watch as it expands and contracts smoothly at your command. This is one of the best space-saving furniture for those who will solo. If you don’t have too many clothes, you can easily contract the closet, and expand it gradually as you start owning more clothes. It’s simple and effective. Priced between $2650 and $3850, this closet might be your answer to your wardrobe issues. Ori’s Cloud Bed, a product that is yet to be launched, can be considered as one of the topmost smart furniture for 2019. 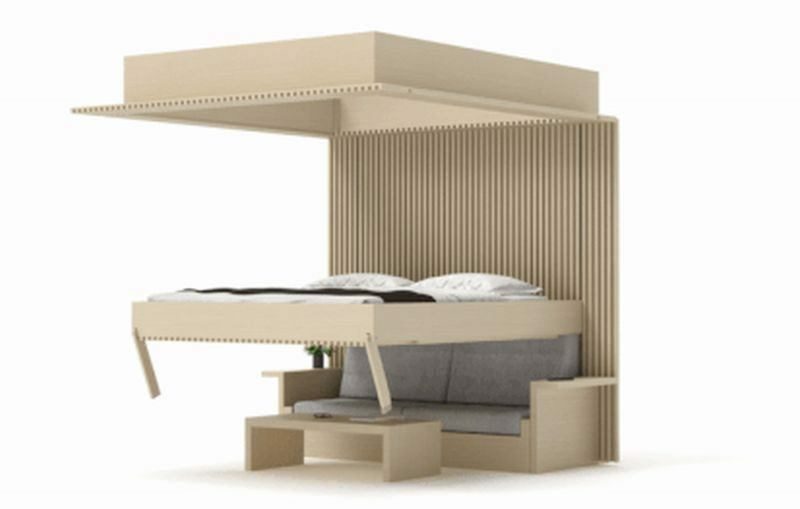 This bed folds itself and fits overhead as a part of the ceiling once you are out of it in the morning. This allows you to use the bed space however you wish. One of the best furniture for small space, Ori’s Cloud Bed is really the furniture all of us deserve.